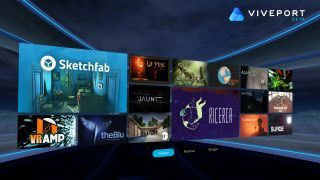 Following in the steps of the Oculus Store, HTC is set to launch its own store called Viveport, but the company is hoping to avoid the features that Oculus fans complain most about. Until now, the Vive's software has been available to download through Valve's Steam store, but later this year HTC will be launching its own store to sit alongside it. The reason for this, as explained by Rikard Steiber, HTC's Senior Vice President of Virtual Reality, is that while Steam is a "great platform" for showcasing gaming content, HTC wanted a means of "shining a light into new categories". These new categories include travel, education and entertainment and brands. Educational content might involve virtually allowing users to explore a different historical period or travel the solar system to get an interactive understanding of a topic. Rikard also elaborated on what the company means by 'brands', and used Ikea's existing VR Experience as an example of ways brands could make use of virtual reality to allow people to shop. The new store draws uncomfortable parallels with the Oculus Store, which carries software for the Oculus Rift headset, the HTC Vive's main competitor. Oculus has been criticized for encouraging developers to make their software exclusive to the store, and at one point blocked a third-party mod that allowed Oculus Rift games to be played on HTC Vive headsets (a move that it thankfully then reversed). Meanwhile until now HTC has allowed its titles to be distributed however developers wish, and its partnership with Valve has meant that most of these have been available through Steam. The good news is that this isn't set to change with the launch of Viveport. Rikard said that the company would encourage developers to make their software available on a variety of different platforms, in order to keep revenue in this emerging industry "healthy". The company's Senior Vice President said that being featured on Viveport would not depend on offering any form of exclusivity, timed or otherwise, and that the company's partnership with Valve wasn't going to disappear. HTC certainly seems to be on the right track with the philosophy behind its new store. It's hard to make the argument that closed platforms are a good thing for virtual reality when the market is currently so small. Although it could be seen as a pain to have yet another software marketplace installed, Steam's focus will ultimately always been on games, and if HTC wants to make an effort to show off the other (read: non-gaming) use cases for the Vive, then this could be an effective means of doing so. Any developers interested in making their content available on the store should register on the Vive Developer portal where they will be able to upload software from today. A beta version of the store will be available soon, with a consumer release promised for later this fall.